India has a large population of tribal people. The major tribes in India are the Gonds, the Bhils, the Santals, the Oraons and the Minas. They belong to different regions, and have their own belief systems and a pantheon of gods and goddesses. The states of Madhya Pradesh, Orissa, Bihar, Maharastra, Gujarat, Andhra Pradesh, West Bengal and the Northeastern Region have a larger concentration of tribal population. According to one of the theory that these tribes, are the earliest settlers in Indian Peninsula and are original people of the land. 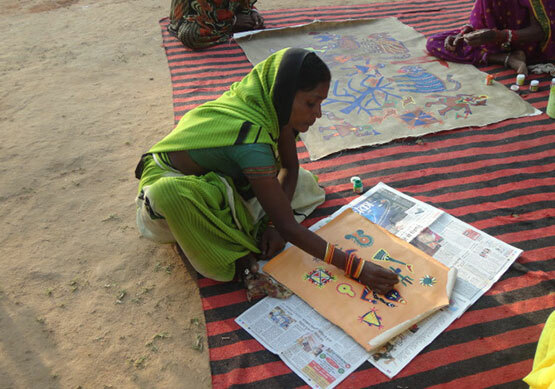 They are called Adivasis, meaning the first settlers . It is believed that with the advent of the Aryans, there were skirmishes between the Aryans and the Dravidians. Some of the Dravidians succumbed to them and were given a servile status and were regarded as ‘Sudras’. Some of them did not surrender to the Aryans migrated to the remote hills and forests where they maintained their independent existence. Tribals have a diverse and rich cultural past. Unfortunately, there is not much documented as the tradition of writing was almost absent. It is therefore difficult for historians and anthropologists to chronicle their past. The subsequent history of the tribals upto the Aryan invasion is shrouded in obscurity.